A teacher by profession, the legendary independence fighter died at 9:32 am, in the Sacred Missions of Mercy nursing home in Fajardo. The Isabel Rosado Morales Committee reported that the body will be on view today at the Civic Club La Seyba, at 106 Lauro Piñero Avenue in Ceiba. On Thursday, starting at 9:00am, there will be a mass held at the San Antonio de Padua Church in Ceiba. Then the funeral procession will begin its journey through the streets of the town, stopping at Escolástico López Street, where she had lived, and ending at the Municipal Cemetery, where she will be buried. Nationalist leader Rafael Cancel Miranda and political ex-prisoner Alicia Rodriguez will deliver eulogies. Doña Isabelita, as she was known by many, turned 107 on November 5, 2014. 15 years ago, she participated in civil disobedience actions in Vieques, as part of the struggle to oust the United States Navy from the island municipality. 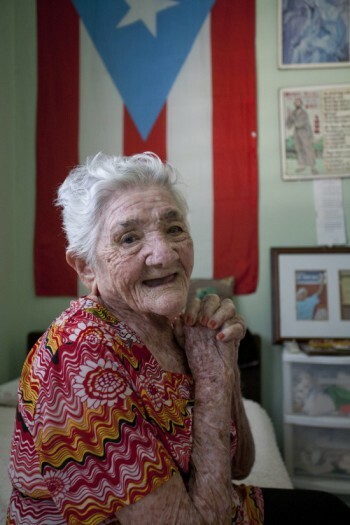 She was also active for decades earlier in the fight against the Navy in Culebra and more recently in demands for release of Puerto Rican prisoner Oscar López Rivera.